Phil Ochs is sometimes seen as a competitor of early Dylan in the realm of political songs, but their methods and visions were very different. Ochs' tool was wit and his favorite medium was political satire and topical subjects; Dylan, more of a poet, worked with symbol, allusion and parable, creating songs that are more in the prophetic vein. The result is that fewer of Ochs' political songs have stood up well over the years; the others give today's listener insight into a turbulent age. Some of Ochs' later songs like "When I'm Gone" and "Pleasures of the Harbor" were more poetic and introspective. Though Ochs played a rudimentary guitar and his plain voice had none of Dylan's authority, he had a warmth, charisma and raw intelligence that come through even now, making new fans. In some ways, his life and career are reminiscent of comedian Lenny Bruce, his contemporary. Tragically, Phil Ochs also took his own life in 1976. Chords of Fame (2-LP set - the previous "best of" collection), Pleasures of the Harbor, All the News That's Fit To Sing, Rehearsals for Retirement. Of course, lovers of Ochs should check out Billy Bragg, his clearest spiritual heir, both for the rawness of his performance, his political vision, and the bite of his humor. 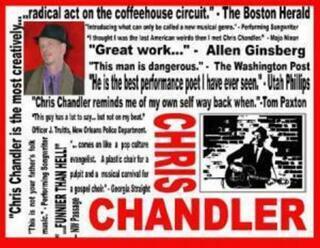 * Chris Chandler - a wildly innovative folk performer - again raw energy, outlandish humor. Phil on LSD.